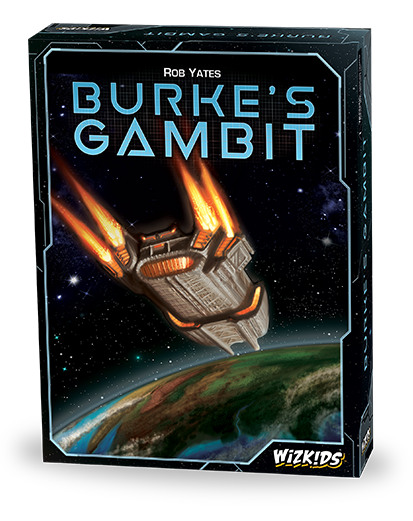 Our partners at Down to Game have reviewed Burke’s Gambit, a social deduction board game set in space! Read on for Caylie Sadin’s thoughts on this game! Burke’s Gambit is a social deduction game (think Resistance or Secret Hitler) with a bit of a twist. Not only are there multiple facets of your hidden identity, but there is also dice rolling involved! So the whole conceit of the game is that you and the crew of the spaceship Burke’s Gambit have been searching for the remnants of an alien civilization. “The Company” is the one employing all of you to search for the advanced alien technology. Once you have loaded your ship with everything it can carry, you shut the doors and start your trip back to Earth. But the ship’s alarm sounds, informing everyone that an alien pathogen is aboard, and one of you is infected. To make matters even worse, the Captain tells everyone that the engines have been sabotaged, and the ship is hurtling back toward Earth. The only way to save Earth is to find the person who is infected and push them out the airlock. But the Company Men, who are called the Acquisition Support Specialists, want to bring that alien specimen back to earth to create a horrible biological weapon. The Salvage Crew want to push the infected person out the airlock to make sure that Earth and everyone on the planet is safe. At the beginning of the game, every player is going to get three cards: an ID Card, a Role Card, and a Parasite Card. The Role Card is public knowledge. Roles are jobs like Technician, Captain, etc. They each have their own individual special once-a-game powers. The ID Cards are secret. This will tell you if you are the Salvage Crew, or if you are an Acquisition Support Specialist (aka a Company Person). If you’re playing with enough people to have more than one Company Person, they will get to know who each other are. And finally, you will each be dealt a Parasite Card. You will not look at this card. The cool thing about Burke’s Gambit is that double blind of hidden information. No one will know for sure if they are infected or not, because you can never look at your own infection card. Throughout the game, you’ll potentially have the opportunity to inspect other people’s infection card, but you’ll never get to look at your own card. So you have absolutely no way of truly knowing if you are infected or not. At the beginning of each person’s turn, they will take a die out of the bag, roll it. If they like the face they rolled, they can do that action. If they do not, they can re-roll it once. At that point, they can either reserve the die, execute that action, or discard the die back into the bag. You can only have one die reserved at a time. The different faces of the die will let you do different actions. 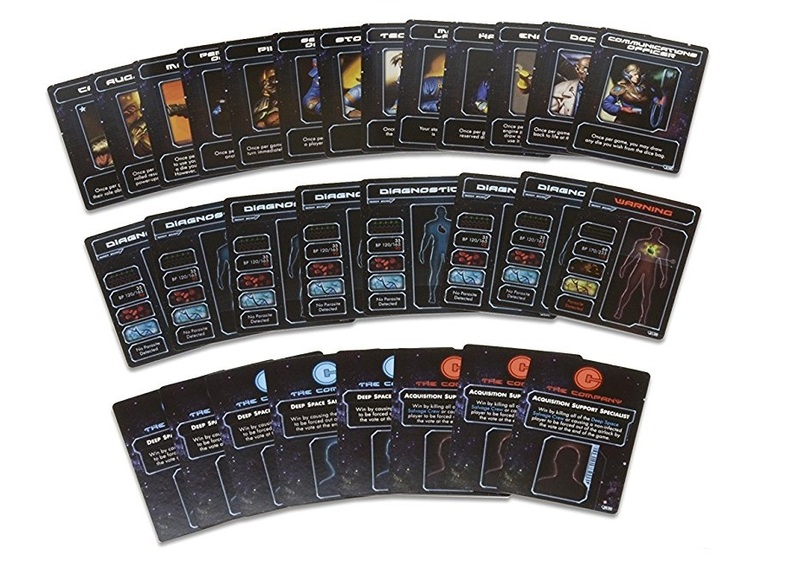 The different actions are: damage or heal another player, check a parasite card of the person on the right or the left of you, speed up the engine, slow down the engine, reshuffle all of the infection cards, check anyone’s ID cards, kill a player, quarantine a player, cancel an action, or look at the parasite card of any player except your own. If you roll the engine power up, your turn is over and the die is played into the center. Once you play a certain number of engine power up dice into the center (it’s dependent on player count), you reach Earth. At that point you have one minute to discuss before you all vote on who to shove out the airlock. If the person shoved out the airlock is infected, the Salvage Crew wins. If there is a tie or a non-infected person is shoved out the airlock, the Company People win. If the Captain is still alive, they break ties. Okay, so what happens if the person infected by the parasite is insta-killed during the game, before you get back to Earth? Well, the parasite simply jumps to another player. The parasite cards are picked up, shuffled, and re-dealt out to the remaining players. And that’s Burke’s Gambit. For being a pretty short game, about 15-20 minutes or so, there is a lot of meat on these bones. I really love the fact that you’re never able to look at your own parasite card. It really adds a level of uncertainty to the game that makes it really fun. 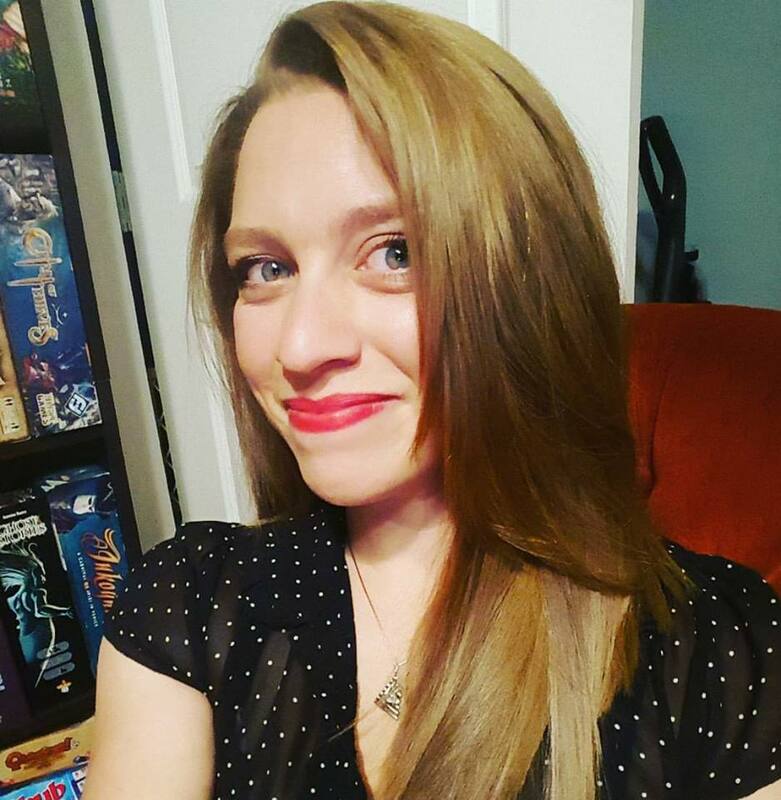 Want to hear what Caylie thought of Burke’s Gambit? Click here to read more!